With the debate over school consolidation starting up again in the Legislature, the Department of Education’s numbers show 50 percent of existing school units – 145 out of 290 – have said no to the mandate. Those 145 units represent 225 municipalities now facing penalties that add up to an estimated $6 million. Another 94 school units representing around 130 municipalities voted to come together and would get to share those penalties to help offset startup costs for their new Regional School Units (RSU), according to a plan supported by Education Commissioner Susan Gendron. There also are 38 units that weren’t required to consolidate because the DOE approved them to stand alone. A final group of eight islands and three Indian school districts were not required to consolidate. With only one proposed district left to go before voters – Acton, Wells and Ogunquit are scheduled to vote March 24 – some say the verdict is in on whether or not school consolidation has succeeded in Maine, but the numbers can and are being interpreted both ways. 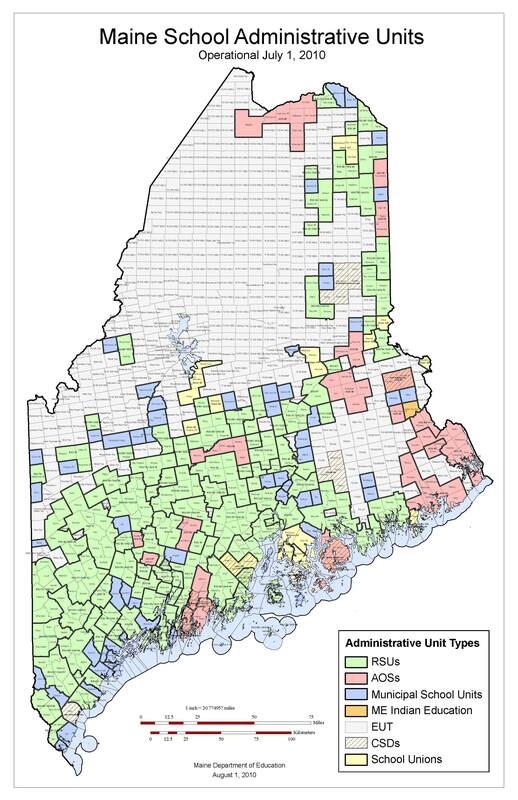 The Department of Education says that nearly 80 percent of Maine students -- 157,208 out of 197,667 -- are now in reorganized districts. The reality is that 101,558 of those students are in the 38 units that did not have to find partners. They are called Alternative Plans. Opponents to the school consolidation law say those districts should not be counted when gauging voter sentiment on the controversial law because they didn’t have to consolidate with any other unit. If one looks at only those districts formed by merging existing units, the number of students in new consolidated districts is 55,650 or 28 percent of total enrollment statewide. Those districts where voters rejected consolidation encompass 37,717 students, or 19 percent of total enrollment. The Alternative Plan districts that didn’t have to consolidate, including the state’s largest cities and towns, make up 51 percent of the enrollment statewide. 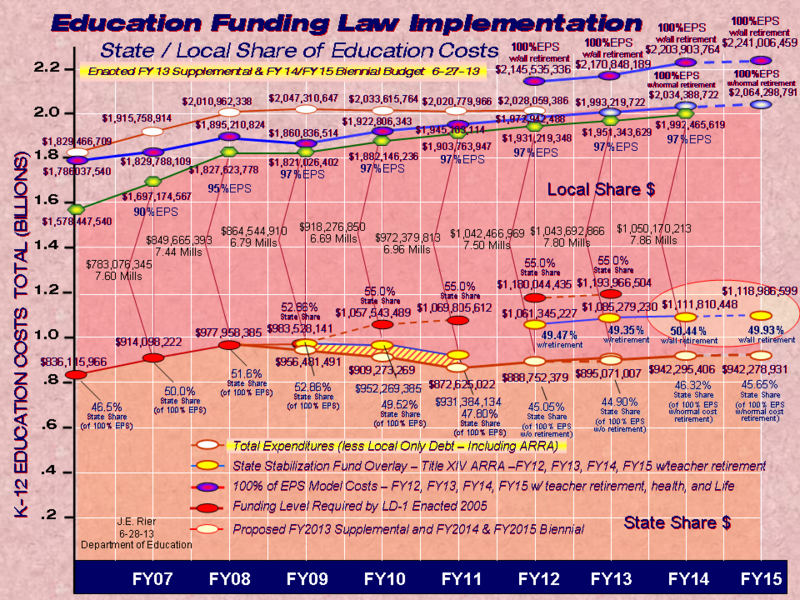 The school consolidation law was passed as part of the biennial budget in 2007. It was an alternative to Gov. John Baldacci’s initial proposal – announced in his state-of-the-state address that year -- to reduce the state’s 290 districts down to 26 for an estimated savings of $240 million in state and local spending over three years. That proposal was changed to call for no more than 80 districts statewide, with an average size of 2,500 students, but no fewer than 1,200. The projected savings were never quantified under the new plan. The law required districts to form planning committees and create consolidation plans, or submit a request to be exempt from the process as an Alternative Plan unit. Those submitting consolidation plans had to put them on the local ballot to get voter approval in the existing districts. Votes were held throughout 2008 and right up until Jan. 27 on 46 plans. Of those, 22 were rejected; 20 were approved; and, four were partially approved, with a piece of a proposed district winning enough voter support to be declared a new unit by the DOE. In four other cases, when a merger was rejected by voters, districts large enough to meet the student enrollment requirement applied to be an Alternative Plan and were approved. While the law says all districts had to be voted on by Jan. 30 and operational by July 1, the DOE is allowing exceptions. Wells-Ogunquit CSD and Acton were given permission to vote in March, and Commissioner Gendron says she will propose legislation to extend the timeline and delay penalties for those districts that supported consolidation, but whose potential partners did not. That legislation will be just one bill out of many the Legislature will be asked to consider this session on the controversial topic. There are 44 bills, according to the DOE, that have been submitted to deal with school consolidation. They propose a delay or repeal of the penalties; replacing penalties with an incentive system; allowing the districts that form union-like Alternative Organizational Structures to get separate printouts on how much each member community is getting in state aid; and, outright repeal of the school consolidation law. There are two vehicles for the Legislature to consider total repeal – either through proposed legislation or as a result of a citizen petition that has been handed into the Secretary of State’s office for signature verification. That verification process is expected to be complete this month. If enough signatures are verified – 55,087 are required – the Legislature will be asked to adopt the proposal to repeal. If they don’t adopt it, repeal will then go on the statewide ballot. Legislators could vote to repeal, but Commissioner Gendron has indicated the governor will then veto that vote. It would take a two-thirds vote to override his veto – considered unlikely given the makeup of the House and Senate. If the proposal makes it to the ballot the fate of the statewide referendum most likely would hinge on who comes out from where to the polls. Please forward this email to your school board members.